Cameras come in all sorts of shapes and sizes and are optimised for some very different things. Here, we are concentrating on cameras for nature, travel and wildlife photography, which helps us to narrow things down a bit. Essentially cameras usually fit somewhere along a scale between small, cheaper, compact and versatile through to large, complex and expensive. The quality of cameras also generally corresponds to the same scale, although there are two types of quality you need to be aware of. There are, for example, some extremely expensive and higher quality cameras that are also small. So in effect, we need to think in terms of build quality and image quality. These two types of quality do not mean the same thing. As a rule-of-thumb, larger format cameras of the same generation (cameras with bigger sensors or sheets of film) produce higher quality images than smaller format cameras. One trap that many people fall into is equating the number of Megapixels of a given camera with image quality. Megapixels refer to the number of individual pixels that make up a camera sensor, you can arrive at this number by multiplying the number of horizontal pixels by the number of vertical pixels. One Megapixel = 1,000,000 pixels. The problem with this measure comes about when we ignore the size of the pixels. Or rather, light receptive sites. All that a high megapixel count means is that there are more pixels jam-packed into a small area. In a digital camera, these pixels are interpolated, to render an image. 'Interpolation' is a fancy way of saying 'educated guess'. Digital camera's do not capture the entirety of an image, they sample a scene and make a guess at the missing colour and brightness information. Obviously, the more pixels, the better the guess. However, the fundamental problem with small pixels is one that physicists have wrestled with for a long time: The accuracy of a signal, like the light signal received by our camera's, is proportional to the size of the signal. What this means is that bigger, more obvious signals produce significantly less noise or random signal. Therefore, it makes sense that the bigger the photo-receptive site, the clearer, stronger and higher quality the signal. It also makes sense that the more light in the scene, the clearer the signal. So, as we can see, it is the relationship between the number of megapixels and size of the sensor that really matters. It is often the case that fewer megapixels yield a camera that is capable of returning better overall image quality because larger individual pixels produce more robust sensitivity to light (It's as if the smaller pixels can't 'see' the light as clearly as larger pixels), while more densely packed pixels increase the resolution or digital detail in the digital image. There is a balance that has to be struck between detail and sensitivity. One number, the Megapixel count, does not do enough to describe this relationship! In fact, looking at the very top end cameras made today will generally reveal a more modest pixel pitch (the size of a pixel) than found in lower-end cameras. This is partly explained by the fact that professional photographers are sophisticated enough to understand that megapixel counts are often used as marketing hype. Starting at one end of the scale is the niche known as 'Compacts' or 'Point-and-Shoot' cameras. These cameras are designed to be extremely convenient and easy to use. They generally fit into a small bag or pocket and are capable of giving excellent results for certain styles of photography. These days, the Point-and-Shoot niche has been occupied by smartphones with digital cameras built in. These are still Point-and-Shoot cameras, just with augmented capabilities. "The best camera is always the one you have with you." These camera's also fulfil George Eastman's (the founder of Eastman-Kodak and the man who pretty much gave photography to the masses) ambition to make "photography as convenient as the pencil." The downside of the Point-and-Shoot is its small form factor and size. The image sensor is generally very small and thus not capable of delivering a top-end image quality. There is not much technology can do about this at the moment, as it is running into the laws of physics. Without increasing the relative size of the sensels and the sensor these cameras will always struggle to deliver premium image quality. Point-and-Shoots are convenient, often connected, smart devices these days. They are always around, can shoot video, can share images quickly and do an adequate job in many situations. However, they are often slow to shoot and deliver poor image quality in low light or when compared to larger formats. For wildlife, they are of limited value while for landscapes and nature close-ups they can be reasonable, particularly if sharing images online is the most that you plan to do. With the advent of the smartphone, traditional camera manufacturers took a big knock in sales of compact cameras. One response has been to 'ruggedize' the compact camera, making it usable where smartphones are not. For example, in extreme sports, or dangerous environments. For example, I use a Pentax Optio W90 waterproof camera on a racing yacht. It is a hard little thing that does admirably in these conditions. There is another niche that these cameras can fill. They are often very useful as cheap lightmeters or polaroid replacements for film photographers but these users are likely to be well versed in photography and able to make informed decisions of their own. Mirrorless cameras are the modern equivalent of rangefinders in the film era. In effect, they have replaced a key component of the modern camera - the viewfinder and mirror system. Rangefinders of yesteryear also removed the need for a prism and mirror (by locating the viewfinder off to the side). Mirrorless cameras have gone one better, using electronics they replicate the view through the lens on an electronic viewfinder. This means, that instead of being off to one side, the view is exactly the same as the camera 'sees' through the lens but delivered to the photographer's eye via circuitry. The great advantage of this is lighter weight and a smaller form factor in hand. Other advantages are a view in the electronic viewfinder that directly represents the exposure and settings of the camera (unlike prism & mirror cameras which are not able to modify the exposure seen by the photographer through the lens). There is no doubt, that as the technology improves, mirrorless cameras will take a greater proportion of market share from mirror & prism cameras. For the moment, they deliver less battery life and are generally perceived to be slower focusing and less robust than mirror and prism cameras. This will almost certainly change and they are likely to be the cameras of the future. Single lens reflex cameras are what I have previously referred to as Mirror and Prism cameras. They utilise a mirror behind the lens and a prism in front of the eyepiece to show the photographer the view through the lens. This is obviously a tremendous advantage when composing a shot. 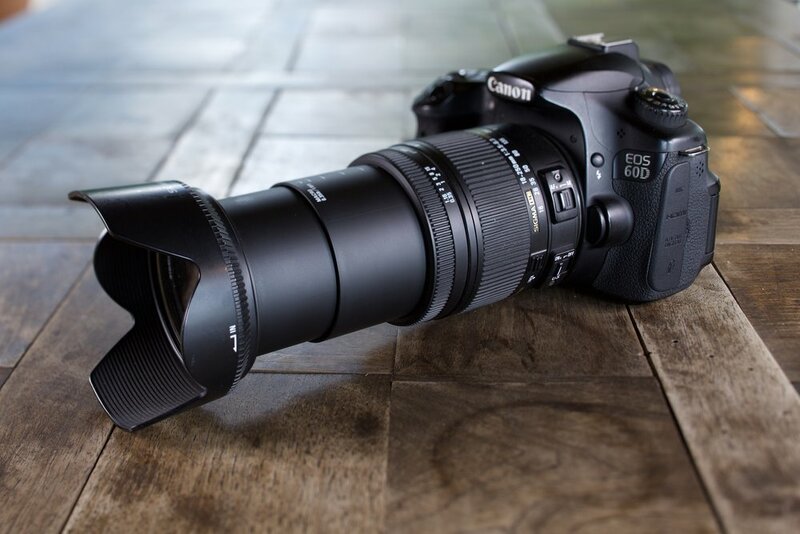 They are generally the camera of choice for most wildlife and nature professionals, delivering the best image quality while still conforming to a relatively compact size. Advantages are interchangeable lenses (mirrorless cameras also have this), generally robust construction, greater battery life (no need to display an electronic view) and faster focusing speeds. Downsides, the mirror flicks up and obscures the view during rapid shooting which can lead to difficulty keeping the camera trained on a fast moving subject. Some bodies are also quite large and heavy. Of course, the mirrorless and reflex (SLR) type designs are just that. They don't necessarily define a form-factor or sensor size. You could conceivably make huge SLR's and this is just what some manufacturers do. SLR's and Mirrorless cameras are generally made in the smaller 4/3 and 35mm sensor format that most people will be familiar with. However, they are also found in larger Medium Format cameras which employ the same design with a much larger image sensor. Medium format cameras usually provide a far superior image to 35mm, but at the same time, they are also hugely expensive and also very large. They are currently unsuitable for most wildlife and nature photography although there are definitely very competent photographers who use them for this purpose. I am not going to delve into the world of Medium Format and Large Format because most people who discover it are already well versed in photography. Suffice it to say, that the sensor size on Medium Format cameras is currently as much as 2.5 times bigger than 35mm, while Large Format sensors are astronomically expensive and are usually foregone in favour of old-school film, which still delivers extraordinary image quality and tonality at sizes 15 times and 60 times bigger than 35mm. Any camera can be used for nature photography but some are better than others. One also has to factor in that there are some very different types of nature photography with very different requirments. Cameras that are easy to handle, produce high quality images and have interchangeable lenses are generally the best options. The interchangeable lenses allow you to reconfigure for different situations. This rules out smartphones which generally don't have interchangeable lenses and are pretty slow to fire with poor tracking focus. In addition to that, the image quality is not the best out there. They can be used for natural landscapes, portraits and some close-up shots but are pretty poor tools for high quality wildlife images. Point-and-Shoot cameras do not fare much better. Often these have built-in zoom lenses which will do a better job than the average phone but they still have small image sensors, poor autofocus and are generally slow to fire. That's not to say that a Point-and-Shoot couldn't be made that could potentially do a good job, just that there is little incentive to produce a camera like this when better alternatives already exist. As we've already seen Mirrorless cameras offer a good compromise of abilities. They are very compact and able cameras and are very well suited to some nature genres. Landscape photography and wilderness photography, which can involve long hikes with heavy packs, are a good example. The image quality and light weight of these cameras is highly desirable. For wildlife photography, Mirrorless is certainly usable but not yet ideal. They do not yet focus as quickly or reliably as DSLR's nor is the battery life as long-lasting. In addition, they are generally not yet as robust in terms of weather sealing and durability - I have no doubt that this will change over time and that they will come to be the mainstream. 35mm DSLR's are probably the most versatile camera that can be used for wildlife and nature photography. This is not just because of the form factor, but also because the image sensor offers a good compromise between image quality, price and portability. It also doesn't hurt that the 35mm format has been around for many many years. Some manufacturers still use the same lens mounts as they did on their first models. This longevity should not be discounted. It leads to a vibrant second-hand market for lenses and accessories that can still be used on the most recent bodies. Availability of accessories, second-hand value and markets all do a great deal to keep 35mm as popular is it is. Medium Format cameras are becoming more affordable. Camera's like the Pentax 645D, 645Z and Fuji GFX50s are breaking new ground. These medium format cameras are far cheaper than others on the market, partly because they have abandoned some of the major features of higher-end bodies (e.g. leaf shutter lenses). They are much more like their 35mm cousins, just with bigger image sensors, better dynamic range and significantly better tonality. They are let down in some respects by availability of adequate lenses (mainly for wildlife), slower focus speeds, bulky and awkward size and chronically slow firing rate (frames per second). For landscapes, portraits, close-up and macro there is little better in terms of image quality in a digital format. For wildlife, they are more difficult to use, simply because they cannot compete with the versatility and ease of use of 35mm. I have no doubt that they will become more affordable and mainstream, especially in Mirrorless form like the Fuji GFX50s. Large Format digital is very rare and extravagantly expensive. Even the relatively cheap Digital Scanning Backs range in price between $6,000 and $23,000. This is nothing compared to non-scanning digital backs. So film is the alternative but it should be mentioned that it is a very good alternative. Film offers unique characteristics that often place it ahead of digital technology. It offers better colour resolution than digital cameras (equipped with Bayer Filters). Film offers better tonal variation and it also manages highlights better. Large format photography is a very technical pursuit and is only really suitable for landscapes, macro and close-ups of static objects in the nature photography context. It does make for truly spectacular images though, especially when printed big! Newer PostFull Frame v Crop - what's the difference?